The brother of a British man due to be executed in China for drug smuggling has made a desperate plea for mercy. In a letter to the Chinese Ambassador, Akbar Shaikh said his brother's life had been destroyed by mental illness. The 53-year-old from north London, who is due to be put to death on Tuesday, has denied knowledge of the 4kg of heroin found with him in 2007. The UN's expert on arbitrary executions said killing somebody who was mentally ill would be a step back for China. 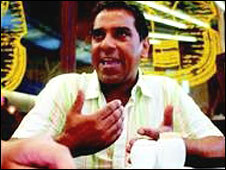 Mr Shaikh, who is married, was arrested in September 2007 in Urumqi, in the Chinese region of Xinjiang. His family says he has bipolar disorder and travelled to China with the promise of being made into a pop star, despite having no singing experience. The charity Reprieve, which promotes human rights, said he was then duped by a criminal gang into unwittingly carrying drugs for them. They say his strange behaviour was "influenced or caused by" his mental illness. Akbar Shaikh said his brother, when healthy, was a kind and harmless man who was much loved by his family. He said: "I beg you to spare his children the trauma of losing their father, and to spare me the agony of losing my brother. "Akmal's cousins are also horrified by the prospect of his death, so far away and without the possibility of being able to say goodbye. "Perhaps the most important of all is the effect this would have on my mother. She is a frail woman, and our family have not been able to break the news to her that she may lose her youngest child next week." UN special rapporteur Philip Alston said there were "strong indications" Mr Shaikh suffered from mental illness, which the Chinese courts had failed to take into account. "Executing a mentally ill man would be a major step backwards for China and I very much hope that the government will grant clemency in this case," he said. Downing Street said the prime minister had written to China's leaders to express his dismay after Mr Shaikh's sentence was upheld by the Supreme People's Court. The case has been raised at prime ministerial level 10 times in the past six months. The Foreign Office said there would continue to be representations at the highest levels with the Chinese authorities. But it would not confirm newspaper reports that officials had been specifically dispatched to China to intercede in the case.